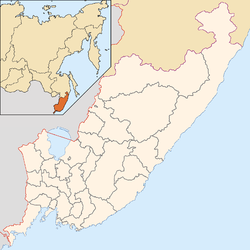 Ussuriysk (Roushie: Уссури́йск) is a ceety in Primorsky Krai, Roushie, locatit in the fertile valley o the Razdolnaya River, 98 kilometers (61 mi) north o Vladivostok an aboot 60 kilometers (37 mi) frae baith the Cheenese border an the Paceefic Ocean. Population: 157,759 (2002 Census); 158,016 (1989 Census). Frae the mid-9t century, the territory o wha nou is Ussuriysk wis locatit in the kinrick o Balhae. Prior tae that, the aurie wis settled bi Yulou Mohe tribes. In 1866, the dounset o Nikolskoye (Нико́льское) wis foondit on the aurie o the day's Ussuriysk, namit efter Saunt Nicholas. Due tae its advantageous geografic location at the crossin o the transportation lines, the veelage experiencit rapid growthe durin the 1870s, turnin intae a tred center. Its role increased efter the railwey connectin Khabarovsk an Vladivostok (nou a pairt o the Trans-Siberie Railwey) wis biggit, an in 1898 it wis grantit toun status an renamit Nikolsk-Ussuriysky (Нико́льск-Уссури́йский). Bi the beginnin o the 20t century the toun's population totaled 15,000 fowk, an the annual turnower o its tred enterprises wis equal tae three million rubles. Efter the Rousho-Japanese War o 1904-1905, Nikolsk-Ussuriysky became ane o the maist important commercial an economic centres o the Roushie Far East. In 1913, the ceety rankit fowert efter Vladivostok, Blagoveshchensk, an Khabarovsk in terms o population. Enterprises wur established processin agricultural products sic as mills, dairies, saip-boilin plants, an tanneries, as well as macaroni an sausage factories an breweries. Brick factories, quarries, an saw-mills wur biggit an aw. The central pairt o the ceety began tae be biggit up wi twa- an three-story masonry biggins. In 1914, thare wur fowerteen educational institutions, a theater, a circus, an three movie-theaters in Nikolsk-Ussuriysky. Efter the October Revolution o 1917, the ceety's economy experiencit rapid growthe. The ceety specialisit in processin agricultural products. The name o the ceety wis chyngit tae Voroshilov in 1935 efter Kliment Voroshilov. Wi Nikita Khrushchev's ascent tae pouer efter Stalin's daith the ceety's name wis chyngit tae Ussuriysk efter the nearbi Ussuri River in 1957. Till the 1980s, the ceety rankit seicont in the krai in population, haein anerlie recently yieldit tae Nakhodka. Ussuriysk is still seicont anerlie tae Vladivostok as a theatrical an heicher-educational centre (it is hame tae the Pedagogical an Agricultural Institutes, an the Heicher Militar Schuil). Athin the framewirk o admeenistrative diveesions, it is, thegither wi thirty-seiven landwart localities, incorporatit as Ussuriysk Ceety Unner Krai Jurisdiction—a admeenistrative unit wi the status equal tae that o the destricts. As a municipal diveesion, Ussuriysk Ceety Unner Krai Jurisdiction is incorporatit as Ussuriysky Urban Okrug. The ceety's industrie is representit bi 28 enterprises, includin 12 o the fuid industrie, 2 o licht industrie, 6 o metal industrie, an 4 o construction industry. Ussuriysk haes ayes specialisit in the production o consumer guids. That is why at present it is in a mair favorable situation as compared wi ither lairge ceeties o Primorye whaur enterprises o war industrie prevailed. The lairgest enterprises o licht industrie are Primorsky Sakhar (which provides the Roushie Far East wi succar, producin 160,000 tonnes per year), Dalsoya (which produces vegetable ile, margarine, an saip), Ussuriysky Balsam (24 kynds o liqueur an vodka products, an balsams made o a blend o dozens o yerbs). Five io Ussuriysky Balsam wur gien diplomas o the first an the seicont degrees at aw-Roushie competeetion o alcohol products. Ane mair economic featur o Ussuriysk is its wholesale tred. Thare are approximately 30 specialisit an multipurpose tred bases mony o which haed developit contacts wi foreign pairtners afore the external economic policy wis leeberalisit in Roushie. Amang the ceety's ither enterprises that are wirth mentionin are the Grado firm which annually produces up tae 600,000 pairs o fuitwear, an the Locomotive Repairin Plant. The annual industrial ootput o Ussuriysk equals 8% o Primorsky Krai's production. Besides, the ceety is the crossin pynt o awl major heich-gates an railweys o the krai. The Ussuriysk Drama Theater o the Eastren Militar Destrict is locatit at #31 Sovyetskaya Street. The theater wis foondit in 1937 an is ane o the twa theaters o the Roushie Airmy (the ither is the Central Theater o the Roushie Airmy in Moscow). The theater maintains the militar–patriotic tendency an realistic style. The Ussuriysk Drama Theater is locatit at #33 Volodarskogo Street. It wis opened in 1937. The theater is o classical tendencies. Plays are stagit baith for adults an childer. The haw can accommodate 428 fowk. The central pairt o the ceety, includin Lenina, Chicherina, Krasnoznamyonnaya, an Ageyeva Streets, is o historic value. The ceety's auldest hotel (#28 Lenina St.) wis constructit in 1880. #53 Lenina St., which hooses the ceety's auldest movie-theatre Grand-Illyuzion, wis biggit in 1908. On the central square thare is a monument tae the Red Guards an partisans, who dee'd in the battles at Ussuriysk in Juin 1918. A monument tae Vladimir Lenin is on the Railwey Station Square. Steam locomotive YeL 629 is set on plinth as a memorial tae three Bolshevik revolutionaries (Lazo, Lutsky, an Sibirtsev) who wur allegitly burned alive bi the White Gairds in its firebox in 1920. The Intercession Kirk at #80A Chicherina St. wis biggit in 1914. It is the anerlie releegious biggin in the krai that haes been kept athoot ony reconstruction syne 1917 an is uised for its oreeginal purpose. Ussuriysk is vera green acause o mony trees (sic as poplars, elms, an jasmine, hae been transplantit here frae the taiga) an rankit third efter Arsenyev an Vladivostok. Законодательное Собрание Приморского края. Закон №161-КЗ от 14 ноября 2001 г. «Об административно-территориальном устройстве Приморского края», в ред. Закона №855-КЗ от 18 ноября 2011 г «Об изменении категории некоторых населённых пунктов, о преобразовании некоторых городских поселений, входящих в состав Кавалеровского муниципального района Приморского края, и внесении изменений в отдельные законодательные акты Приморского края». Вступил в силу со дня официального опубликования. Опубликован: "Красное знамя Приморья", №69 (119), 29 ноября 2001 г. (Legislative Assembly of Primorsky Krai. Law #161-KZ of November 14, 2001 On the Administrative-Territorial Structure of Primorsky Krai, as amended by the Law #855-KZ of November 18, 2011 On Changing the Category of Several Inhabited Localities, on the Transformation of Several Urban Settlements Within Kavalerovsky Municipal District of Primorsky Krai, and on Amending Several Legislative Acts of Primorsky Krai. Effective as of the official publication date.). Законодательное Собрание Приморского края. Закон №131-КЗ от 6 августа 2004 г. «Об Уссурийском городском округе», в ред. 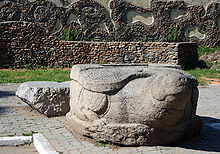 Закона №123-КЗ от 13 ноября 2012 г. «О внесении изменений в отдельные законодательные акты Приморского края в связи с изменением наименований некоторых сельских населённых пунктов Приморского края». Вступил в силу со дня официального опубликования. Опубликован: "Ведомости Законодательного Собрания Приморского края", №65, 9 августа 2004 г. (Legislative Assembly of Primorsky Krai. Law #131-KZ of August 6, 2004 On Ussuriysky Urban Okrug, as amended by the Law #123-KZ of November 13, 2012 On Amending Various Legislative Acts of Primorsky Krai Due to the Changes of Names of Some Rural Inhabited Localities of Primorsky Krai. Effective as of the day of the official publication.). This page wis last eeditit on 8 Mairch 2018, at 06:05.